Penny’s voice carried a note of good-humoured despair, as if she had really given up hope. They went zigzagging up the grey slope in single file, first Tim with the rucksack, wearing his navy Rugger shorts, with his red-topped football stockings making the only specks of colour in the whole gloomy landscape, and then Penny in her belted school mackintosh, with the moisture glinting on her black hair. They never turned round to ask if I was all right. Now that I had handed over the rucksack to Tim, with all the food inside, I was free to fall over a precipice, sink into a bog, or just lie down and perish of exhaustion, as soon as I liked. On the whole I preferred to plod on. observations: One of the joys of Twitter is the people who recommend lovely clothes in books to me: recently the YA author Lydia Syson said there were some awesome ‘tangerine slacks’ somewhere in Geoffrey Trease’s Black Banner books, so naturally I had to look for them – women in trousers is very much a continuing theme on the blog: click the label below, and see my Guardian article here. At some point in my extensive early reading of Trease, I had taken in the fact that he was very left-wing in his personal politics, but I’m sure I wasn’t aware of the slightly subversive nature of these books - that was quite a surprise. They are very good examples of the home/school/adventures genre: the young people get lost in the fells and have to camp out. The school sports day looms large. Friendships are built. But the big plot here concerns a farm that has been requisitioned by the War Office during WW2, and then not returned. The young people campaign to have it released – and Trease goes into our duties as citizens, the proper ways to try to effect change, the importance of respect for democracy, and the ways some people will try to manipulate the world. It’s like the best-ever (and most subtle) citizenship lesson, and very much carried and hidden by an excellent and interesting plot, which is never boring. I thought they’d all start singing the wonderful Woody Guthrie song ‘This Land is My Land…’ at one point. 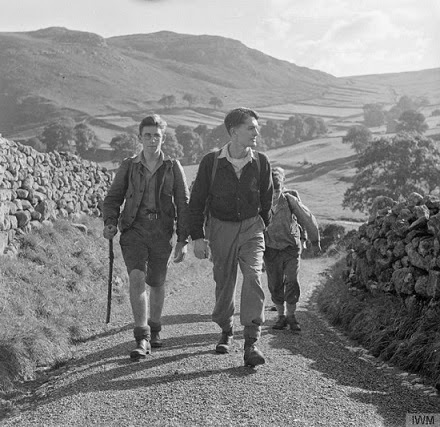 The picture shows young hikers in Yorkshire a few years earlier, and is from the Imperial War Museum. Moira - It's not every author who can write well in more than one genre. I love it that Trease wrote YA fiction as well as historical. And I do like the touch of wit in the bit that you've shared. I get the sense he was a bit of an environmentalist, too - perhaps I'm wrong about that? Either way I really like the idea of using a good story to help young people understand how to make change in the world. Yes you are right - he always sounds like a lovely man, and definitely interested in keeping the world how it should be in all directions. His love for the beauty of the Lake District shines through these books. Thanks for reminding me about Black Banner. Read it ages ago and loved it. Love Trease's historical fiction too. I like the citizenship lessons hidden in an interesting story. Another author I have not heard of although in this case, not very strange that I have not. I look forward to more about tangerine slacks. No, not surprising, very much a Brit author - and not much remembered here either. But very nostalgic for me to revisit. Tangerine slacks? I don't think I have heard of them, Moira. In my youth, in the late 70s and 80s, bell-bottom trousers (or flares) were popular and I can't believe I actually wore them back then. They were western imports. Oh yes, I remember the days of flares and bell-bottoms too. Surely they came in bright colours...? There was also something called loon pants, similar, I don't know what defined them. Did you have them too? Loon pants? No, I don't think so, Moira. Did loonies wear then?! Apparently it was short for balloon pants! Sounds unlikey. I think they were the ones that flared a lot from the knee, tight above that. Often they had a v-shaped seam at the knee. I think more beatnik/artistic implications, but what I am going to say in my blogpost is that Penny was unusual in 1956 in being allowed a huge interest in stylish clothes AND very ambitious ideas for university. Go Penny! Did you say you were at Newnham? If you can find The Gates of Bannerdale, it is about going to Oxford in the 1950s, and you would prob enjoy the chance to contrast and compare. I loved looking at that site, which I didn't know, it appealed to the mean and unreasonable side of me. Perfect. Decades ago, I had bell-bottom jeans in lavender and another pair in a pumpkin color. 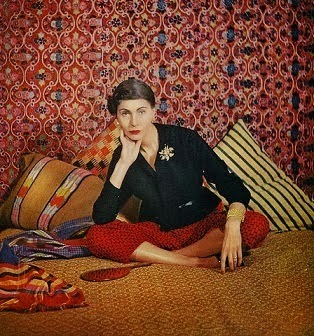 Ah, the days of wearing colors. I miss them. How lovely! Nothing was ever described as 'pumpkin'-coloured in the UK, because we didn't really have pumpkins when I was growing up.... I can actually remember the first time I came across it as a colour, in an American knitting magazine in the 1989s. How exotic it seemed.